February seems made for chocolate, doesn't it? Whoever decided that Valentines should receive a box of chocolate was a genius! It makes for evenly-spaced candy consumption for most of the winter. Christmas is the big one, of course, then just as that candy's petering out, along comes Valentine's Day. Perfect! With a little self-control, you may even be able to last until Easter. Although, if you hit the after-Valentine's sales, the only self-control you'll need is the for the number of boxes that go in your cart. 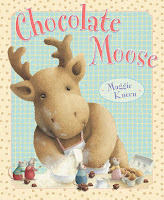 Unfortunately, it's a very small shop, and Moose is rather large. After wreaking havoc, but keeping the mouse babies well entertained, Mrs. Mouse has a better idea for a job for him. Sweet and fun. Moose looks so cuddly, just like a favorite stuffed animal; too bad his efforts in the tiny shop only keep making things worse. This was a new one for us and we liked it. Junie, Jakie, and the baby are hot, hot, hot. What they all need is a day at the lake! 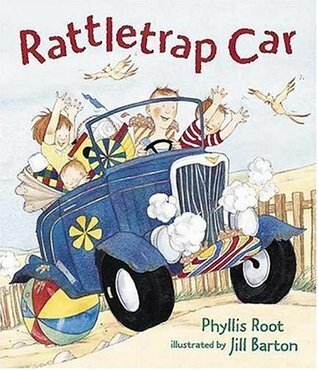 However, their old rattletrap car may not be able to get them there. They pack up a picnic, including a big bucket of chocolate-marshmallow fudge delight, and they're off! At least, until the next thing on the car breaks. But never fear, they are nothing if not resourceful! Not to mention absolutely determined. 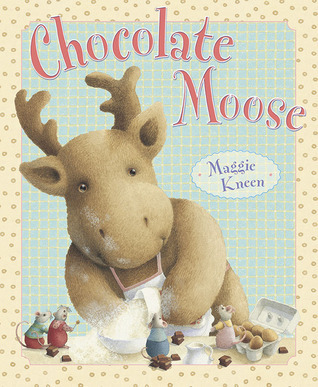 This is one of my all-time favorites to read-aloud! 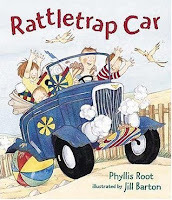 You can't beat the delightful pictures, the beach toys that just so happen to fix the car (with plenty of chocolate marsmallow fudge delight on hand), and all the noises on every page. So much fun! After a few readings, even my youngest can tell the story himself. Two little girls in vastly different climates talk about something they have in common: cocoa ice. One little girl is from Santo Domingo, where she picks the cacao bean pods and helps her family prepare them to sell. The other girl is from Maine, and her family harvests ice from the river in the winters. This is a beautiful book. The cut paper and paint illustrations are vibrant and detailed. It would make a great starting point for a homeschool lesson, or even just a good discussion. Where do the things we take for granted come from? This one is longer--more like a chapter book in picture book form, so keep that in mind. You'll want to set aside at least 20 minutes to read it. Your preschoolers might just need a summary as they look at all the pictures. 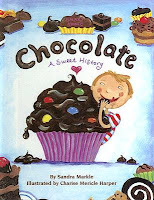 This was a great introduction to chocolate for my younger elementary-school aged kids. It goes into growth of the cacoa beans, production, history, and a bit about Milton Hershey. Photographs are interspersed with captioned drawings. Most pages have 1-2 paragraphs of text, which was just about right for my kids' attention spans. Your library may not have this exact title, but they probably have something! Head on over to Dewey number 641.6 and see what you can dig up! Here we come to some of our favorite read-alouds ever! I don't know that I need to say much about this one, other than we loved it! 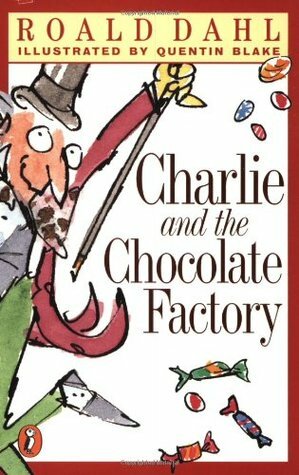 My kids were enthralled by the chocolate factory itself, felt nothing but sympathy for Charlie and his grandpa, and were completely satisfied with the consequences dished out to the awful kids. They even liked the [older] version of the movie. This is a winner. Henry Green loves chocolate more than anything else. In fact, that's pretty much all he eats for breakfast, lunch, dinner, and snacks. Not only does it not give him a bellyache, it has never stunted his growth, made him fat, or even given him one cavity. It seems like he's got it made. diagnosed him with Chocolate Fever, and more and more people come to poke and prod at him. He can't take it anymore. He runs! A kindly trucker named Mac eventually picks him up, but then some hijackers enter the picture. How in the world is Henry going to get out of this mess? A very quick read-aloud, with 1-2 pictures per chapter. My kids laughed out loud in several places--always a good sign! Mac and Henry have a good discussion about being proud of who you are and what you look like--no matter if you're black, white, or white with brown lumps. It was an unexpected bonus. 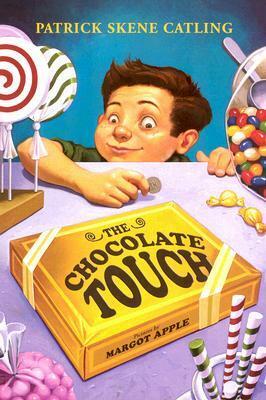 John Midas loves candy of all kinds, but especially chocolate. One day he finds a strange coin on the sidewalk. Even more strange--it's got his initials on it! He then finds a little shop he had never noticed before, selling delicious-looking chocolate. He spends the coin in the shop for one single piece of amazingly good chocolate. Then he discovers that everything he puts in his mouth turns to chocolate! Awesome! He eats his whole tube of toothpaste! Then it extends to things that he touches, as well....which isn't so bad, actually. At least until all he wants is just a drink of nice cold water...oops. Watery chocolate. Or he wants to give his mom a hug. Oh no! Chocolate mom! When his new gift becomes a curse, he has to figure out how to break the spell and go back to normal. Soon! We loved this one! My kids thought it was hilarious. Who Was Milton Hershey? 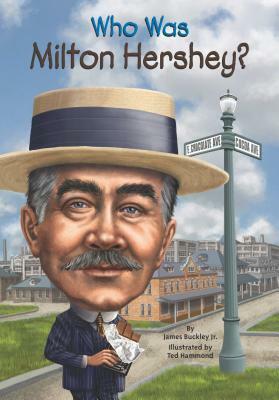 by James Buckley Jr.
Tells the life story of Milton Hershey in 10 chapters. Features line-drawing pictures on nearly every page, larger type, with 1-3 chapters per page. I don't know that my kids would pick it up on their own, but my oldest read it when I brought it home from the library.My younger two may sit through it in a couple of chunks. By all accounts, Hershey was a wonderful man, who spent his fortune to help others. This introduction to his life was on-target for 2nd grade and up. Kate and Cecilia are cousins and best friends. They tell each other everything. Unfortunately, that has just gotten a little harder, as Kate is off to London for her first Season, leaving Cecy behind at Rushmore Manor. So they write letters--long and often. It's a good thing they do, too! 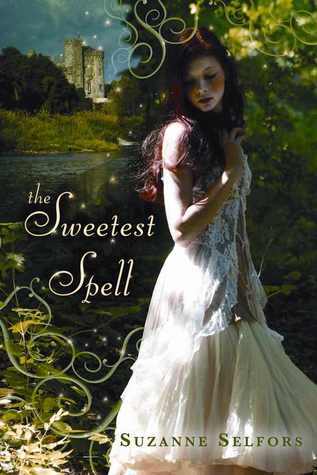 There's a mysterious old woman named Miranda who tried to poison Kate (by mistake) at the Royal College of Wizards, while Cecilia is having troubles of her own brought on by the return on her grumpy wizard neighbor, Sir Hilary Bedrick. There's also the Mysterious Marquis (Kate) and James Tarleton (Cecilia) to keep the girls baffled, amused, and entertained. Then the girls and guys team up to bring down the evil magicians. That's when the fun really begins! Victorian age, but with magic--though not steampunk. The entire book is written in letter format. A little to slow to get going, perhaps, but then a solid, enjoyable read. Emmeline Thistle is a dirt-scratcher's daughter, which puts her on the very bottom rung of society. If that wasn't bad enough, she has a twisted foot that makes her even more of a village outcast. At least the cows understand her. Then two catastrophic events change her life forever: all the village men are called away to war, and a flood washes away her entire village. Emmeline recovers downstream, in the home of a kind family that isn't afraid to do the right thing, no matter who she may be. 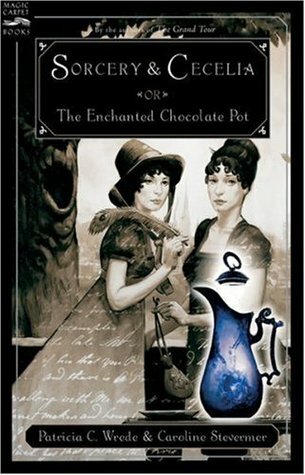 Then a third event changes not only her life, but the entire country: she discovers a talent for churning cream into chocolate--a magical substance that has been lost for centuries. Before Emmeline really knows what's happening she is the most sought-after girl in the country. All sorts of people, from all walks of life, want to use her gift for their own purposes. As a result, her world keeps expanding and contracting in unforeseen ways, when really what she wants is to get together with Owen Oak, the son of the family who took her in. Meanwhile, the history she thought she knew gets revised again, and yet again. Perhaps at the end of all this, the truth will prevail...perhaps. Reviewed here. There were some things I liked about it and some things I didn't like at all. If you read it, let me know your thoughts! 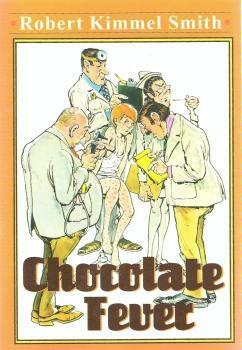 An absolutely fascinating look at the two biggest chocolate companies in the United States: their rivalry, business practices, founders, and what happens on the factory floor. It was published in 2000, so obviously it's a bit dated. I may have read it in 2005....anyway, it was a long time ago. So I don't remember a lot of details. Here's what I do remember: I remember being so into this book that I talked about it to every person I knew. I remember going to the grocery store and checking out the candy bar displays, to see if my store was giving an edge to one or the other. Also, telling my husband at random moments in the store--"Hey! Did you know that Mars (or Hershey) actually owns [xyz brand]?" He put up with it admirably. What is your favorite kind of chocolate? 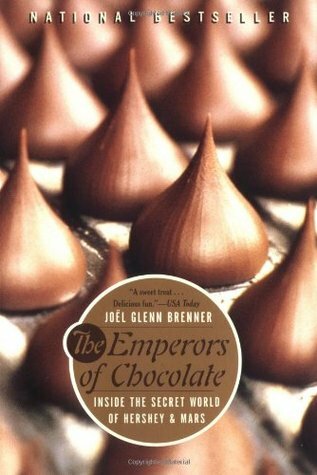 Have you read anything with a sweet theme lately? I love that you included middle grade, since I can't keep up with books for my 8 year old, so any suggestions are amazing. I also love that you note if the juvenile books are clean. I hate getting into a book (especially YA!) that has content I don't really want. Thanks! I hate being surprised by bad content, too. The YA books are definitely hit-or-miss on that score. They will generally be more clean than adult books, but it's not a guarantee.